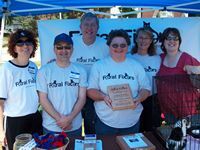 In addition to processing our 1,000 cat today (see previous blog story), today was also the occasion of the 2nd annual DASA Dog Wash & Walk, an event that Feral Fixers hosted a booth at. DASA is an acronym which stands for "DuPage County Animal Shelter Alliance" and is an organization which was pulled together by DuPage County Animal Care & Control. It consists of all shelters, rescue groups and other animal welfare groups (such as Feral Fixers) in DuPage County who want to get together to discuss common problems and, hopefully, come up with common solutions. This event was held, as last year, at the IIT Campus, near Danada Square, in Wheaton. Attendance was very good and the people who staffed our booth (Board Member Kurt and super-volunteer Laura) were kept busy almost the entire time talking with interested passers-by about TNR. But, the best part of this event, IMHO, was our celebration of TNRing our 1,000th cat and the surprises that we had cooked up for our President, Tammy. The first surprise was a plaque that we gave Tammy, commemorating this event. The first picture in this blog post shows a close-up of the plaque. The second picture shows, from right to left, Chris (our Secretary), Regina (a Board Member), Tammy, yours truly (another Board Member), Kurt (a third Board Member) and, to the far-left, Laura, one of our super-volunteers. The second surprise was provided by the above-mentioned super-volunteer, Laura. 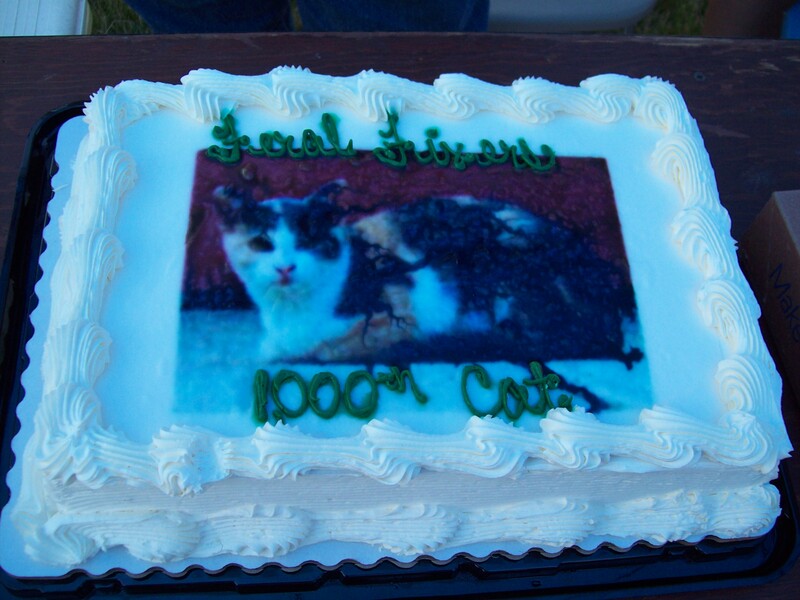 Our 1,000th cat was named "Raspberry" and was from a colony that Laura has been working on with us. Laura took a picture of Raspberry and had it put on a cake - and then she brought the cake to the DASA Dog Wash & Walk. Thanks Laura! So, all in all, a really good and momentous day for Feral Fixers. Thanks again to everyone who helped make it possible!